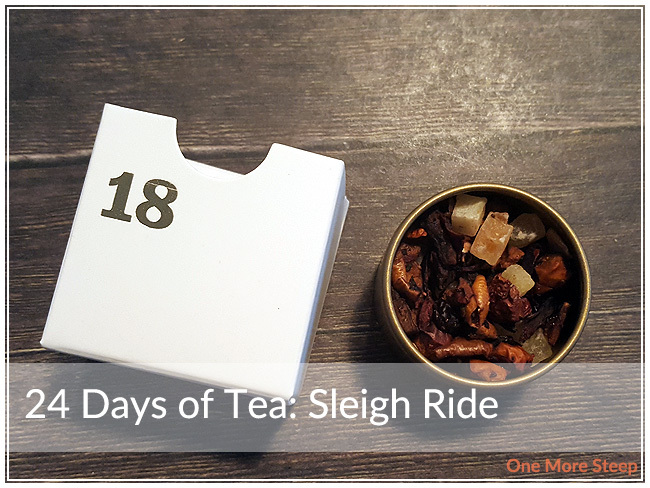 I wasn’t sure what to think when I pulled out day 18 of the 24 Days of Tea and saw that it was Sleigh Ride. I’m 90% sure that I’ve tried it in store before, but it’s hard for me to remember since I’ve sampled so many teas in the past. The first thing that I thought when smelling the dry tea is that it smells like the red heart cinnamon candy that is very commonly found around Valentine’s Day. Sleigh Ride has that spicy cinnamon smell to it, and I can’t really make out the rest of the ingredients. Sleigh Ride is a mix of: apple, hibiscus blossoms, pineapple, papaya, beetroot, cinnamon, raisins, coconut, roasted almonds, popped rice, natural and artificial flavouring. The recommendations for Sleigh Ride are to steep in near-boiling water (90-95°C/194-203°F) for 4 to 7 minutes. I steeped for about 5 minutes. 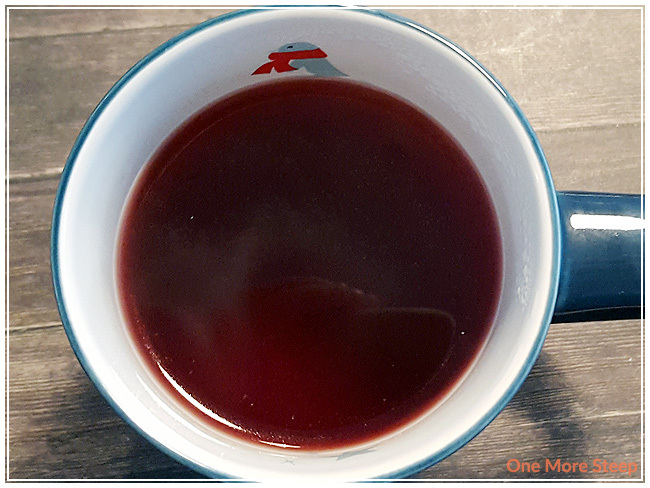 Sleigh Ride is a fairly bulky tea with its ingredients, I used the entire tin to steep my cup of tea. Sleigh Ride steeps to a beautiful deep pink that reminds me a lot of Bear Trap or Strawberry Rhubarb Parfait. There’s a very strong cinnamon smell to this tea, and it tastes like cinnamon as well. There’s a mix of sweet fruity flavours and some sourness to it as well. The sour notes aren’t very pleasant. Sleigh Ride is weird to me, because some sips tastes like apple cinnamon and that’s just delicious, the others are just sour and tart and makes me unhappy. This isn’t something that really evokes the feelings of winter or snowy days to me, which is what I think they were trying to aim for with a name like Sleigh Ride. I did add some sweetener to this one (honey) and it does help to temper that sourness that I’ve tasted in the tea. 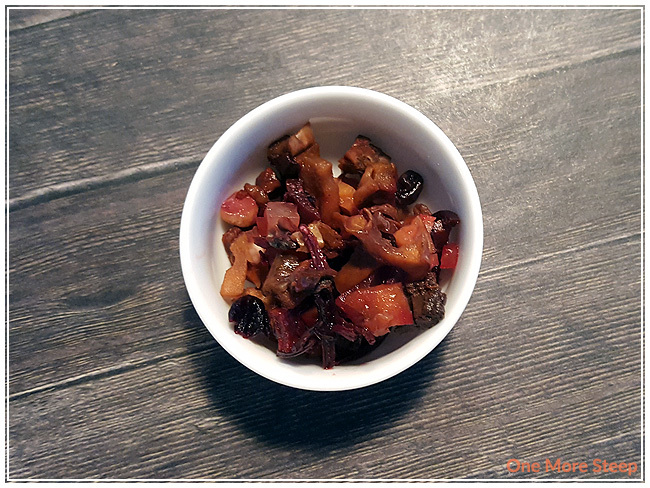 I don’t resteep fruit infusions, Sleigh Ride wasn’t an exception to that rule. 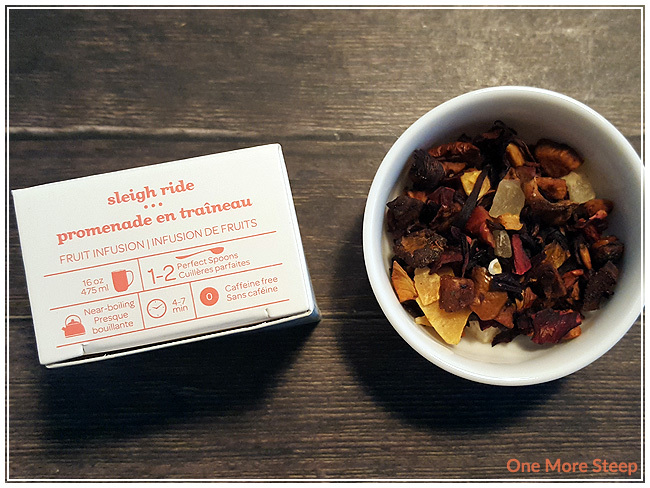 I didn’t like DavidsTea’s Sleigh Ride. The sourness to this tea isn’t pleasant. Perhaps it’d be better as an iced tea? I find that the sour notes don’t help to endure me to this tea, and I think there have been better fruit infusions in the 24 Days of Tea calendar so far.